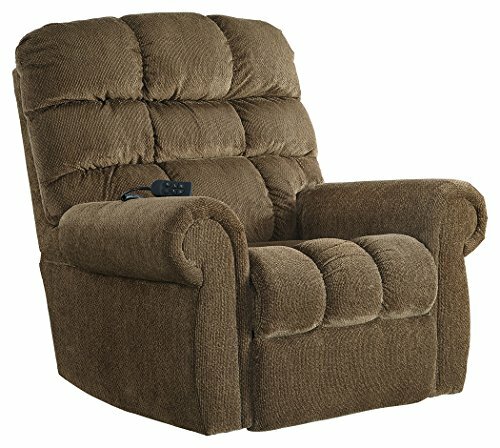 This powered lift chair has extra plush cushions for greater comfort. Its high-resiliency foam cushions in supple polyester will provide great support. It also has a chenille-feel upholstery and a sleek palette, which ensure that this lift chair will fit right in even in the most elegant home. The chair also features a back-up battery in case there is a power outage. It features a one-touch setting to control the lift feature. Its dual motor design takes custom comfort to a new level. All fabrics are pre-approved for wearability and durability against AHFA standards, and its metal frame is strong and durable. The power reclining mechanisms allows for infinite reclining positions, and the lift function will make it easier for your loved one to stand up. This lift chair has some of the best lift chair reviews I have read. Many of the reviews come from elderly people or people with disabilities. They attest to the fact that this chair has made it much easier for them to sit and stand up, which they couldn’t do before. Reviewers praise this chair for the wide range of positions it offers, which make it great for sitting or even sleeping in.